In 1694, rice arrived in South Carolina. Rice has been grown in southern Arkansas, Louisiana and east Texas since the mid 19th century. Many Cajun farmers grew rice in wet marshes and low lying prairies where they could also farm crayfish when the fields were flooded. In recent years rice production has risen in North America. Rice cultivation began in California during the California Gold Rush, about 40,000 Chinese laborers immigrated to the state and grew small amounts of the grain for their own consumption. Commercial production began only in 1912 in Butte County. By 2006 California produced the second largest rice crop in USA. Place olive oil in skillet over medium heat. Add onions, cook until tender. Add sausage, pepper, garlic herb seasoning and salt. Cook rice according to package directions. 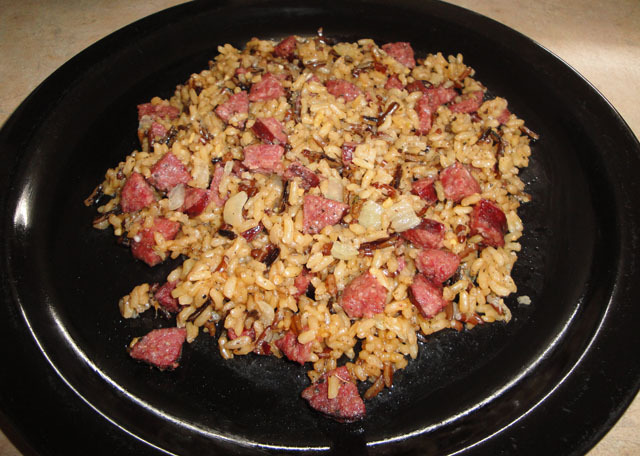 Once rice is cooked, add rice to sausage and stir well. Enjoy! This sounds really wonderful, Christine! Yummy! Thanks, Tammy. It was easy, quick and yummy. And the pecan smoked sausage is awesome. Sounds like an awesome recipe!!! I love all the ingre. that you used..Delicious!!! Thanks for the visit. I love visitors, comments and emails. I also love sharing stories and recipes. I love cooking. I actually want to go to culinary school. Thanks again for stopping by. What a tasty, easy meal. Yummy. I've not seen smoked pecan sausage in our local grocery. I'll have to see if I can find some. This looks like a terrific weeknight meal. Hi Mother Rimmy, you may want to go to Wal Mart, that's where I got mine. Or you can use any smoked sausage, such as Hickory smoke sausage, or use your favorite smoked sausage. Thanks for stopping by. I make something very similar to this...It's very easy and very good.